IRISH MMA star Conor McGregor has posted a cryptic message on social media after being released on bail following an attack on a bus filled with rival fighters. Posting under his handle of "thenotoriousmma" on Instagram, McGregor shared a picture of himself shown from the back walking towards a car in New York. The only caption was the "praying emoji". It's the first post in five days from the father-of-one after he was released on US$50,000 bail on Friday after facing a US judge on assault and criminal charges following the frenzied attack that was caught on camera and injured two other athletes. An earlier image showed him getting into a car with someone sheltering him from the rain under a large black umbrella. Last week, the 29-year-old was seen lobbing a trolley at the window of the bus in the Barclays Centre in New York in what UFC president Dana White labelled "the most disgusting thing that's ever happened in this company". 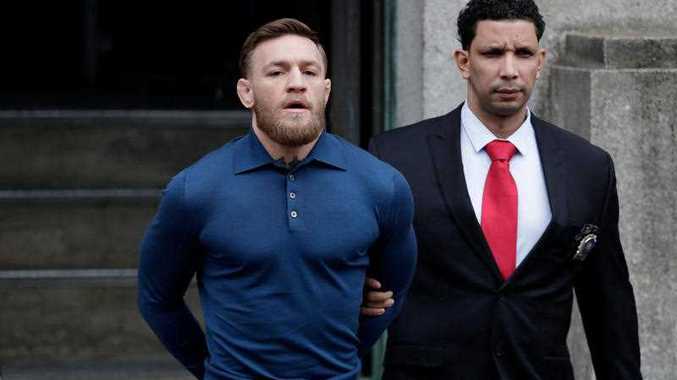 McGregor was also seen on CCTV throwing a chair at a passenger window and punched a security guard, the Brooklyn Court heard at his arraignment. Two athletes were wounded, forcing them to be pulled from the upcoming UFC 223 card, the Ultimate Fighting Championship confirmed. Lightweight Michael Chiesa sustained facial cuts and flyweight Ray Borg multiple corneal abrasions. He stood before a judge in jeans, saying nothing except "yes your honour." The bail package will allow him to travel before facing court on June 14.